What are commercially exploited fish? "The north sea herring stock crashed in the 1970s, but has now recovered. ICES, 2007"
Commercially exploited fish and shellfish are all living marine resources targeted for economic profit such as the bony fish, sharks and rays (known as elasmobranchs), crustacean such as lobsters and shrimps, and molluscs (including bivalves, cuttlefish and squid). It also includes other creatures such as jellyfish and starfish. Good Environmental Status is achieved for a particular stock only if all of the three attributes are fulfilled. This implies that all commercially exploited stocks should be in a healthy state and that exploitation should be sustainable, yielding the Maximum Sustainable Yield (MSY). MSY is the maximum annual catch, which can be taken year after year without reducing the productivity of the fish stock. Why should we pay attention to commercially exploited fish? Heavy fishing pressures, such as overexploitation or overfishing, can have very negative environmental impacts. They can result in the loss of significant potential yield of the stocks being fished and can even precede severe stock depletion and fisheries collapse. Because of overfishing, fish stocks can reduce dramatically to the point where they lose internal diversity and with it, their capacity to adapt to environmental changes. Fish communities can be altered in a number of ways, for example they can decrease if particular-sized individuals of a species are targeted, as this affects predator and prey dynamics (the question of trophic relationships and marine food webs is the focus of Descriptor 4). What are the main pressures on fish and shellfish stocks? The current situation is that most fish stocks have been overexploited as a result of excess fishing capacity (Figure 2). State of stocks in Community fisheries. 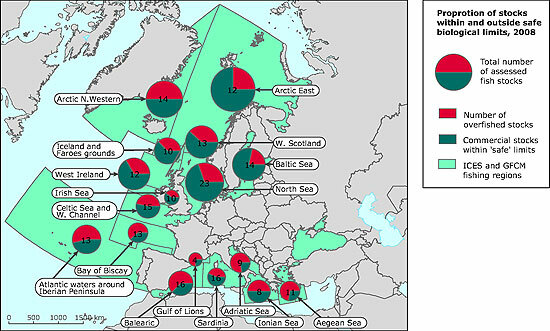 Source: EEA 2010"
According to the European Commission, 63 % of EU stocks (for which the information is available) are being fished beyond MSY; this means that these fish populations could be larger and generate higher economic output if they were subject to reduced fishing pressure. In addition 30 % of these stocks are outside safe biological limits, meaning that they have a high risk of depletion. Many European fisheries today depend on young (and smaller) fish, which are caught before they can reproduce. Maintaining stocks within safe biological limits (to avoid depletion) is still a requirement. However, the objective of fishery management is now more ambitious, aiming for sustainability at higher long-term yields. The MSY concept is illustrated schematically in the figure below. Fishing mortality is directly related to the way a stock is being fished. Yield will increase as more fishing capacity is applied (more vessels or fishing effort) until it reaches a maximum level. 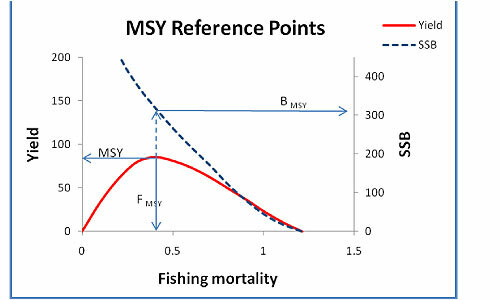 If fishing mortality is increased further than this MSY, yield will decrease because smaller size fish (which are too young to reproduce) are being caught, leading to a continuous decline of the Spawning Stock Biomass (SSB – or total weight of mature fish) (ICES 2007). Restriction of the quantity of fish that can be taken from the sea before fishers need to stop fishing (total allowable catches). The CFP has also been providing funding and technical support for initiatives that can make the industry more sustainable. In 2009, the Commission started a review of the CFP to make it more efficient in conserving fish stocks, ensuring the economic viability of the European fleets and providing good quality food to consumers. In July 2011, the Commission adopted its “Communication on the reform of the common fisheries policy”. The proposal will now be discussed in the European Parliament and in the Council and the reformed CFP will enter into force in 2013. Fisheries have a wide impact on the marine ecosystem, including on its biological diversity (Descriptor 1), food webs (Descriptor 4) and sea-floor integrity (Descriptor 6).